Extra pounds place an excess burden on bones and joints and can make arthritis problems worse. Overweight dogs are less able to exercise and play comfortably and their breathing may be labored. Their bodies may be less able to resist infections, and they may be at greater risk for problems during surgery and anesthesia. Over-fed puppies tend to become overweight dogs. They also have a greater risk of developing orthopedic problems. Properly fed puppies will be less likely to suffer from weight problems later in life. Weight Loss – Steps To Success! Weigh your dog. Set a weight loss goal. Feed the proper amount of Life’s Abundance Weight Loss Dog Food and adjust accordingly. Exercise daily (not to exceed veterinarian recommendations). Avoid table scraps and an excess number of high calorie treats. Track weight loss progress weekly. Remember, a quick weight loss is not healthy so be sure your dog is getting enough food and that he loses weight slowly. Easy to feel ribs without excess fat covering. Viewed from the side, belly is tucked up. Viewed from above, a noticeable waist in front of the hips. Difficult to feel ribs with excess fat covering. Viewed from the side, belly has minimal or no tuck. Viewed from above, no waist in front of the hips. Weight loss for most dogs involves increased exercise and eating food with fewer calories. It’s generally easier to feed normal amounts of a low-calorie dog food than to feed much smaller amounts of his/her regular dog food. In addition, your dog will not feel as hungry when fed a normal amount of food. 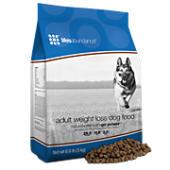 Life’s Abundance Weight Loss Dog Food is a revolutionary weight loss dog food based on a 30-30-40 ratio of protein, fat and carbohydrates. This revolutionary new weight loss dog food will help your dog achieve a balance so his or her body can operate at its maximum efficiency while shedding unwanted pounds. Get Wholesale Prices Without Going On Autoship. Call us today at (281) 205-0429 or (800) 428-6416. Life’s Abundance products at wholesale.